The blue Hibberd 4wDM has a Dorman engine and was ex-works on 28/3/1956 to cake makers J Lyons & Co Ltd, Greenford, Middlesex. As built she had a 77hp Dorman 4DL engine, weighed 18 Tons and carried both works number 3716 and chassis plate number 2111. In 5/1967 she was sold to Rugby Portland Cement Co Ltd, Barrington Cement Works, Cambridgeshire, per Thomas Hill (Rotherham) Ltd. She was acquired by Thomas Hill (Rotherham) Ltd in 6/1983 and moved to their works at Kilnhurst, South Yorkshire. In 4/1985 she was sold to Coal Contractors Ltd, Roughcastle opencast coal site, Falkirk, Central Scotland and by 12/2001 to Hall Construction Services Ltd, Bowburn, Co. Durham and stored in their yard. 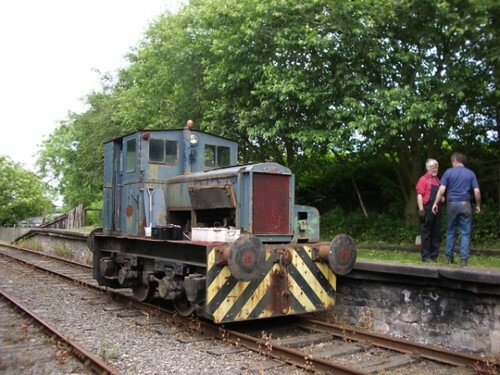 In 6/2005 she moved to Marley Hill and has seen use on permanent way trains. At some stage, she was fitted with a more powerful Dorman engine , but where and when this was done is unknown. Sign up to our e-newsletter and keep up to date with news, events and developments at the Tanfield Railway, the World’s Oldest Railway.